Crafted with an ergonomic grip, these boning knives are ideal for commercial use in restaurants or butcher shops. Each knife also features a high carbon steel blade for sharpness and durability. A handy set of three boning knives, it includes a 5", 6" and sticking knife. Equipped with plastic handles, they also offer optimum control and comfort even with heavy use. These plastic handles are also easy to clean and sanitize. 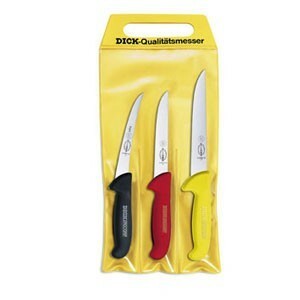 One knife features a black handle and the others red and yellow for use in color coded knife systems.